You guys i hate playing favourites – but the tie side waistband is my favourite variation of the Flint pants. So pretty and unique, and surprisingly practical! Sewing this waistband up is really fun as it’s quite different to a normal waistband. 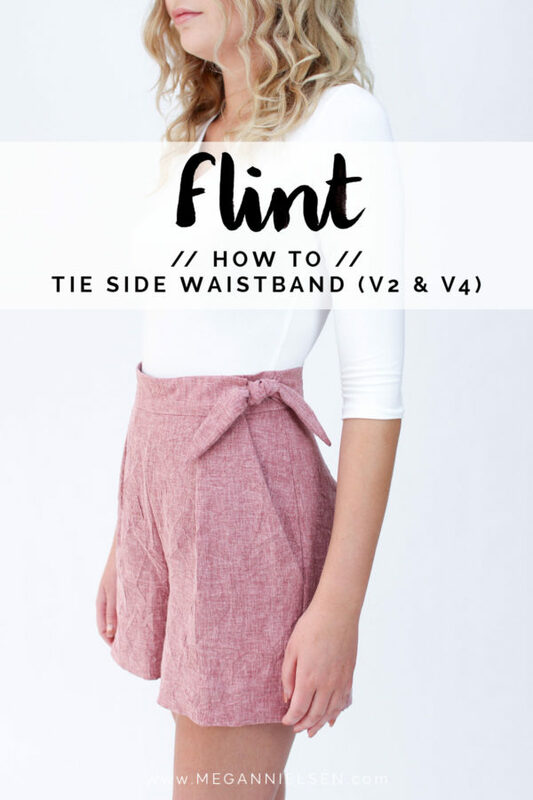 I really hope you enjoying this tutorial – click through to learn how to sew the Flint tie waistband! I love it when we get to this stage, as the pants are really starting to look like pants! 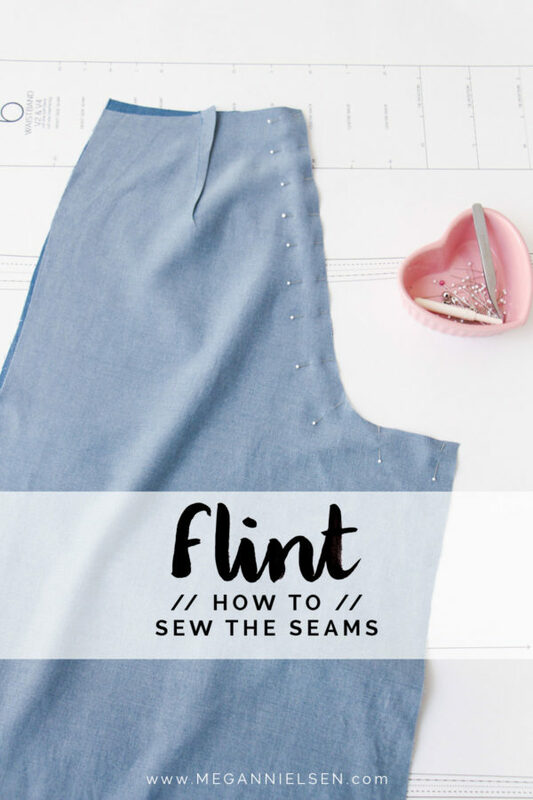 Today we are going to be sewing the seams of your Flint pants or shorts, and it’s super easy my dears! My absolute favourite feature of the Flint pants is the crossover pocket opening. I love it so much that I want to add it to every pattern forever – ok kidding i won’t, that would get super boring am i right? This opening is a really cool feature, and results in a really sleek unique pair of pants or shorts. It’s not difficult to do once you’ve had a look at the steps carefully and gotten your head around it! I am so excited to bet kicking off the Flint pants sewalong today! I’m going to walk you through sewing perfectly neat release tucks and darts on your pants (or shorts). These are small and relatively simple tasks, but i think it’s really worth taking your time and making sure they are done neatly, because otherwise when your garment is finished it’s going to be super obvious if you have wonky darts. I hope you have been finding the Flint tutorials helpful so far! 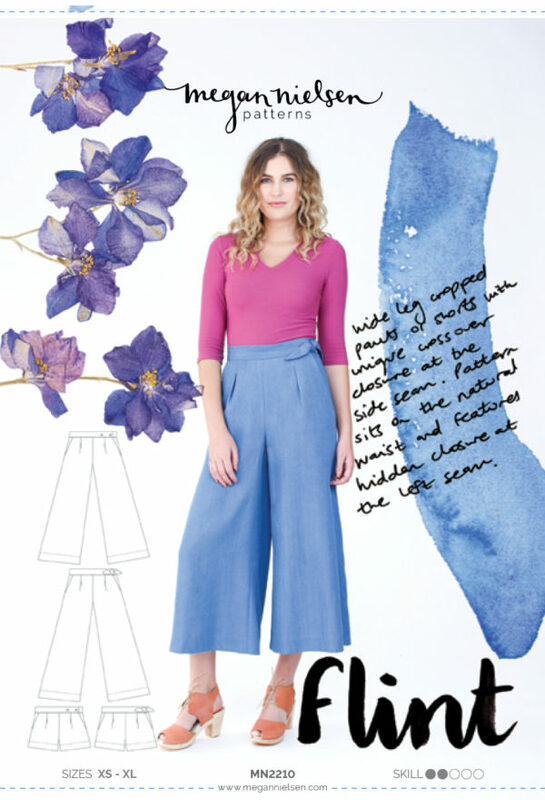 Today i’m going to share with you a few of my inspirations and ideas for making and wearing the Flint pants or shorts! I have had a lot of fun collecting inspiration images on Pinterest, so make sure you follow the Flint Pinterest board for ideas as i’ll be adding more daily. This pattern is so versatile and can work with a huge variety of fabrics to slightly different effect. Stiffer fabrics will result in a more structured garment with very distinct wide legs, whereas a looser drapier fabric will result in a flow garment that resembles a skirt. Think about how you would like to style your pants as well as where you will be wearing them, as those factors will affect your fabric choice. For a more casual look I love denim, chambray, tencel, linen and fun prints like stripes! These are a few of my weekend/casual styling inspirations for Flint. I love the idea of a bold stripe in a loose comfy linen for lounging around and hanging out. I prefer my casual wardrobe to include light loose fabrics that are comfortable and don’t require a lot of ironing. Which means when i wear linen i just embrace the wrinkles! I really like the idea of removing the release tucks and making Flint in denim as a more stylish alternative to jeans. For a casual look i love pairing a cropped tee like Briar or a loose tank. Sandals are obviously a great choice for warm weather, but don’t overlook sneakers – this is one of my favourite pairings and it’s a great sports luxe look to try out. Another variation i’d like to try is lengthening the side ties to be longer and more dramatic! With the appropriate fabric this pattern very quickly becomes sleek and sophisticated – perfect for work or going out. I love the idea of pairing Flint with a blazer or structured blouse. Don’t underestimate black – i know we can talk down black a lot, but there is something to be said for having an amazing pair of black pants in your arsenal! I’m currently making myself a pair of black brushed cotton Flint pants, and i’m seriously excited to have a good pair of black pants in my wardrobe. Crepe is also one of my favourite fabrics to elevate this pattern to the office or event. I’d love to try a silk or rayon as this pattern loves to work with drapey fabrics. Obviously Rowan is a great choice for pairing with Flint, but don’t overlook other great blouse options like the Reef camisole or Eucalypt tank. These make show stopping outfit combinations! 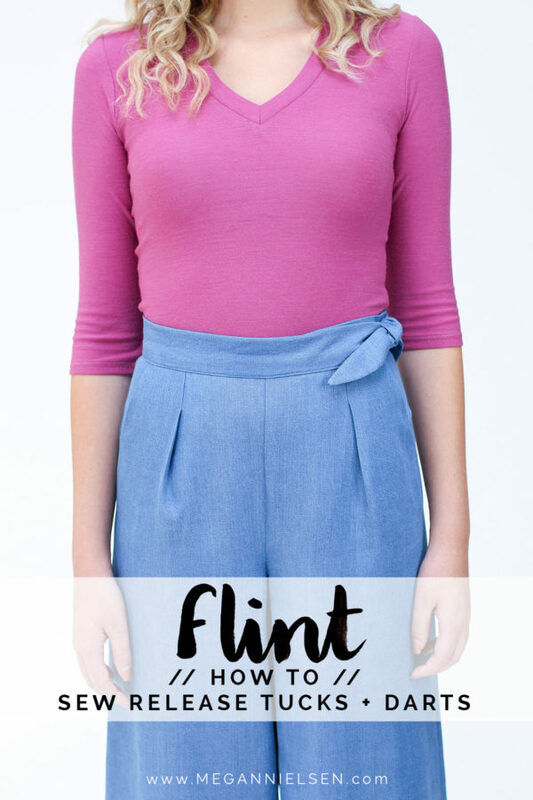 I really want to try making a matching set – a blouse and Flint pants out of the same fabric. I think it would be really chic and a little play on a jumpsuit without having to deal with wearing an actual jumpsuit. A lot of people have asked me about making these pants for cold weather, and i think it’s a great winter option! I wore my denim Flint pants the whole of last winter and found them to be great paired with a pair of luxe sneakers. Don’t be afraid to layer over the top of Flint, it can handle it! Chunky sweaters can be your friend! Winter fabrics you might want to consider are denim, corduroy or even wool. These will keep you warm and will work perfectly with the Flint pants. You can even lengthen your pants to full length for extra warmth. Personally i want to make a corduroy pair for this winter, probably in a lovely camel colour if I can find it somewhere! I also think adding a turned up cuff is a great variation idea and think it would work especially well with a wool. 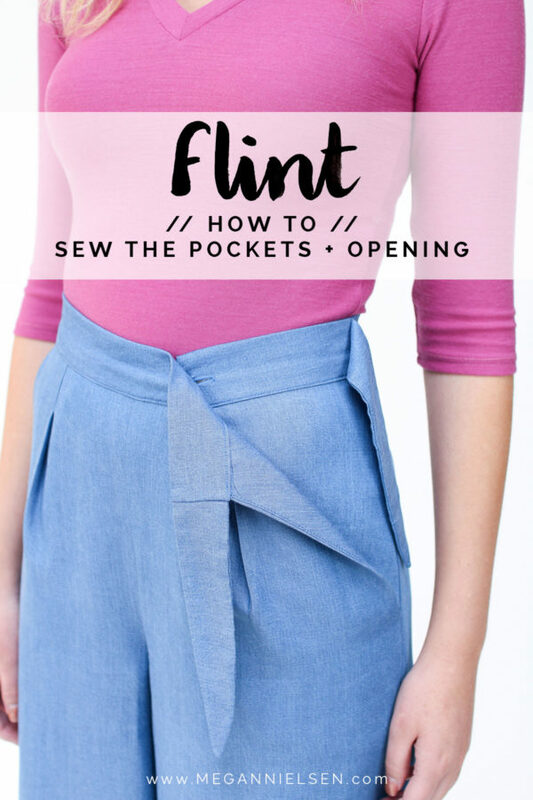 Don’t have the Flint sewing pattern yet? Get it in store here! We absolutely love seeing what you make, so don’t forget to tag your creations with #MNflint and @megannielsenpatterns if sharing on social media.